During September, I’ll work on two pages simultaneously. This September Foliage 2018 post will contain more specific information about the ever changing foliage status in the area. The September 2018 Daily Journal for JH and GTNP page will contain some foliage information, but will focus more on wildlife and landscapes. You’ll want to go to both regularly.Note: Think of this page as a day to day or week to week resource containing mainly “record shots”. The photos are not intended to be “wall hangers”, but more documentary in nature. Also, this page will grow in size and scope as the month progresses. Check back regularly! Continue reading "Foliage Reports September/October 2018"
Tips for a better visit from a 31 year resident and local photographer. 1: Do some pre-trip planning! The good news…Grand Teton National Park is open all year! Summer visitors have access to most roads and facilities. It’s beautiful here all Winter, but you’ll find fewer roads and access. Grand Teton National Park is home to many species of wildlife, however you might need to time your visit based on what you are hoping to see. For example, bull Moose will not have antlers from late January through mid-August. Many mammals will be shedding winter fur during the Spring months, but those months are the best months for the babies. Remember, some of the wildlife migrates out of the region while others hibernate during the Winter months. Weather can be an issue at any time of the year. It helps to bring warm clothing at all times of the year. Temperatures can drop to below freezing overnight, even in the summer, yet warm up to comfortable temperatures by afternoon. We have experienced heavy snow on July 4th! You’ll know you are in Grand Teton National Park via a few entrance signs, however much of the Park lacks clear signage identifying its boundaries. This is especially true on the East side of the park. Pick up a Park map as soon as you can, or visit click the link below to view the official Park map. Note: Visitors entering GTNP via Yellowstone pass through a gate a Moran Junction, then enter the highway. Many believe they are out of the Park, yet they are still well within Park’s boundaries. Check the maps before letting your dog off its leash or considering using a drone anywhere in the Jackson Hole area! Wildlife viewing rules state that humans must stay 100 yards from bears and wolves, and 25 yards from other wildlife. Visitors must follow the instructions of on-site rangers and volunteers, even if they are are more strict than printed rules and documentation. 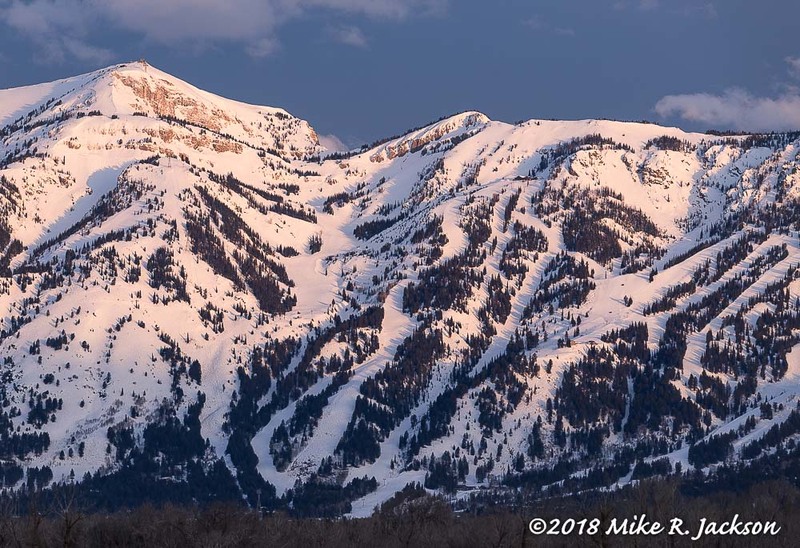 Continue reading "10 Tips for a Grand Teton National Park Visit"
Jackson Hole Ski Resort: April 1st is the traditional Gaper Day at Teton Village. “Gaper–Day is a mountain tradition that takes place in ski resorts across North America. It is the day when locals can dress in the most ridiculous outfits and pretend to be like their gaper counterparts. Their getup can range from no or very limited clothing (only shorts) to the most retro ski attire there is.” Nikon D850 and Nikon 70-200mm Lens, Handheld. 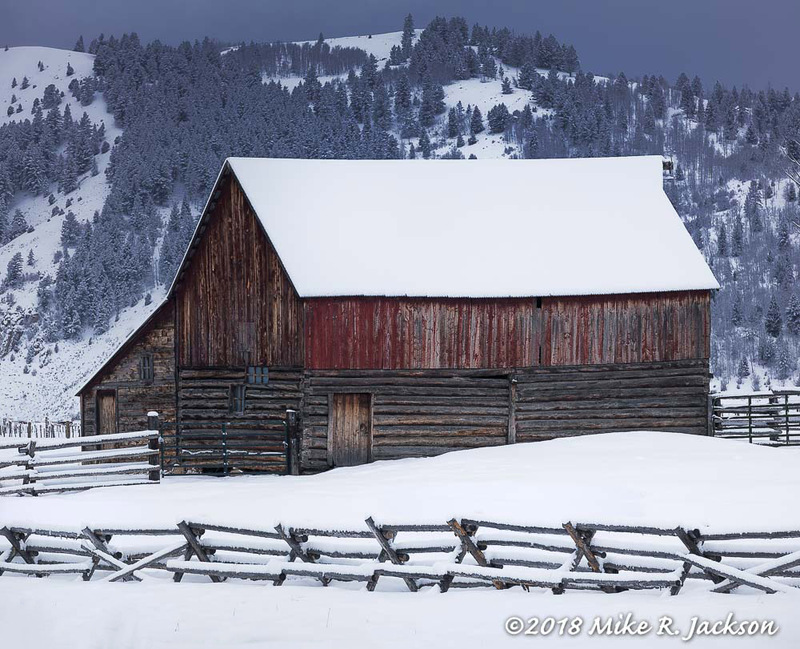 Continue reading "April 2018 Daily Journal for JH & GTNP"
The Jackson Hole valley is magically transformed into a “Winter Wonderland” following a big overnight snow storm. Four to eight inches of the white powder is perfect—allowing the new layer to blanket the old dirty snow and clutter. When this happens, the world looks pristine again. It’s a great time to be cruising the Park’s available roads and trails! There are plenty of landscape opportunities, both after a Winter storm and during the storm itself. A lot of Grand Teton National Park’s 310,000 acres is closed to human activity in the Winter. Likewise, many of the roads and pullouts are closed to vehicular traffic. 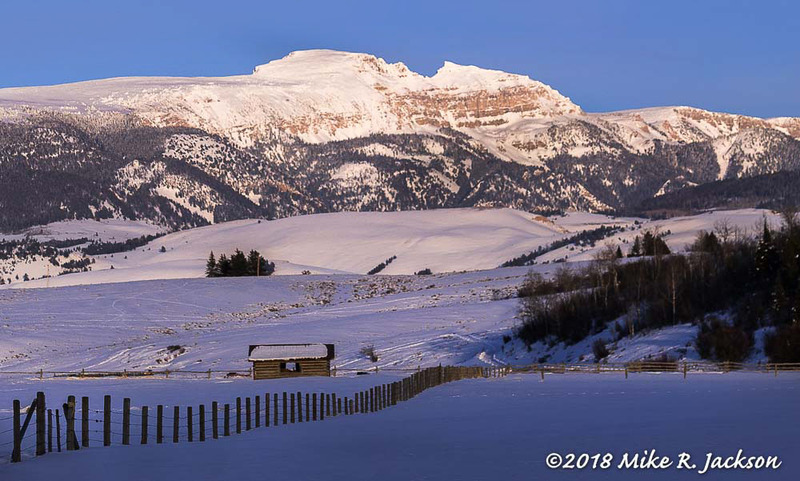 It occasionally feels like we have little access, but there’s a fair amount of GTNP open to hiking, snow shoeing, and cross-country skiing. Additionally, I like to augment my Winter photography by traveling some of the area’s county roads. You’ve probably been to a sub shop with a paper order form and a small pencil on the counter top. You check your choice of meat, cheese, lettuce, tomatoes, pickles, salt, pepper, mayonnaise, mustard and so forth. They assemble the sandwich to order based on the checked boxes. Wouldn’t that be nice for landscape photography! It doesn’t work that way, of course, but there are a few elements that we all wish for—and would check if we could. 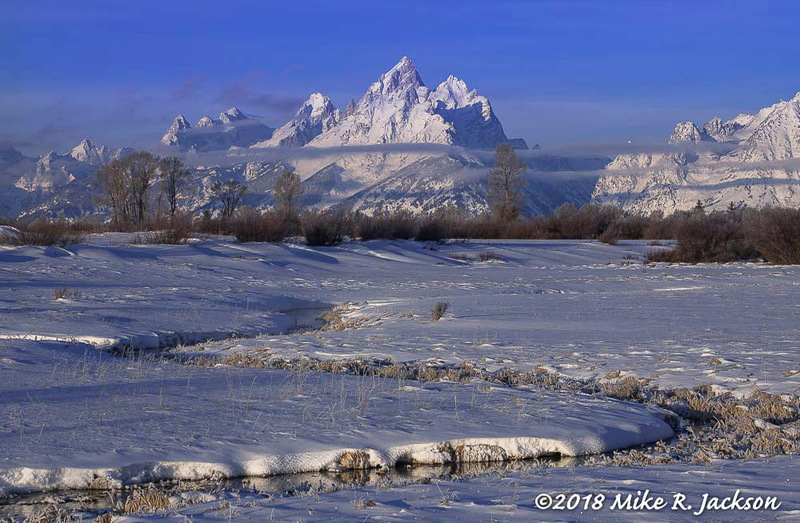 Winter landscapes in Grand Teton National Park often include views of the Grand and the Teton Range. That’s why people come here! Ideally, Mother Nature offers up some great morning light and clouds behind the snow covered peaks. Clouds and dramatic lighting often separate an every day image into something special. Early morning shots typically offer more chances to get the romantic lighting, but it can happen at any time of the day. Conditions do not always have to be perfect! On days I can see the mountains, I am looking to put some sort of subject, like a small barn, in front of a wide view of the valley. The barn or stand of trees might simply be an accent or foreground element. 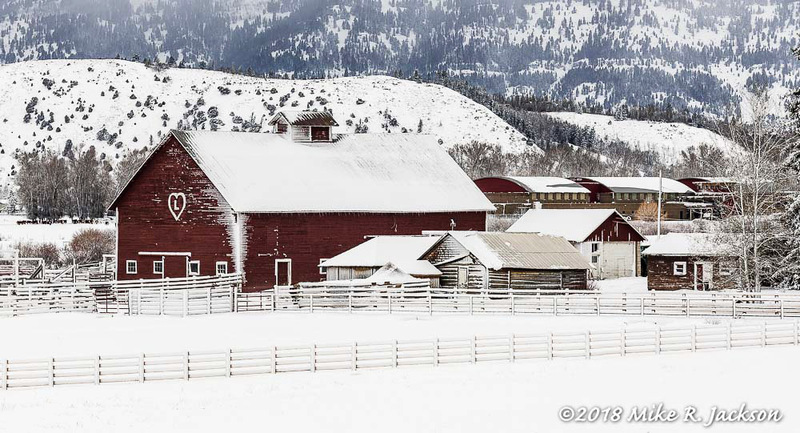 On overcast days, the snow covered barn or stand of trees might be THE subject. Just like photography in the other seasons, it helps to be flexible and adjust to the conditions. I think there are two scenarios for landscape photography. In the first one, you find a location and composition you like, then wait for the dramatic light and clouds. It might even take several trips to get the shot. In the second scenario, you are driving around and “presto”, the dramatic scene is staring you in the face. Stop, set up, and take the shot. Few people viewing your photo will ever know which scenario was in play when you captured the image, but you’ll know! There is never an apology needed for the serendipity shots. Not all fresh snow is the same. It can wet and sticky or dry and fluffy. Additionally, with no wind, the snow can gently settle on any horizontal plane or it can be windblown and drifted. Sticky wet snow can cover the sides of vertical planes during a windy storm. There’s so much variety and so many opportunities! 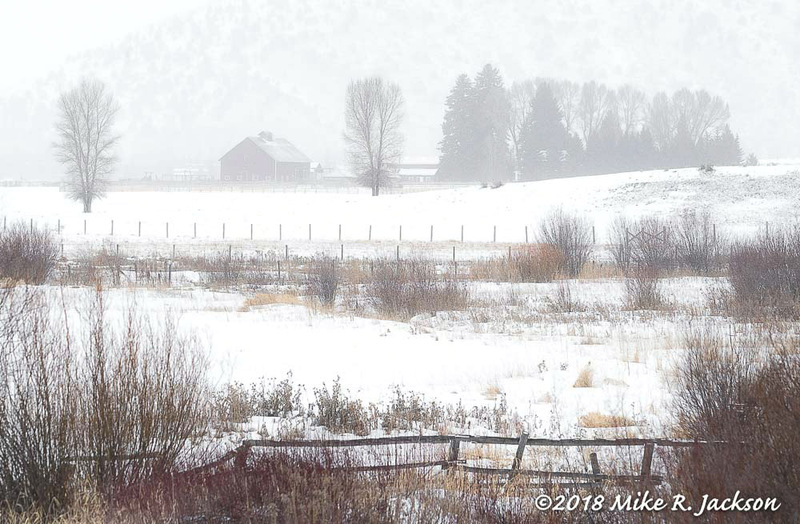 Photography during a snow storm can be more challenging. The size of the flakes and the distance to the subject are two of the big factors. Exposure time can be adjusted for artistic, streaking effects. It helps to check the front of the lens regularly. Blowing snow always seems to find the glass! After a storm, the prime “window of opportunity” can be limited. Wind can blow fresh, light snow off the branches and structures. Sun often begins the melting process. Winter often feels like our longest season. That, of course, depends on where you are in the valley. By May 1st, some people have already mowed their yard at least once, but snow banks and berms near String Lake can still be higher than most vehicles. By late Fall, I am always ready to see fresh snow and by late Winter I am ready to see hints for green grass and budding trees. Even as Winter wanes, I almost always think about the shots I didn’t take or places I wish I had gone. There’s always next year. Daylight hours are limited during the Winter months. The shortest day is usually December 21, but it takes a month or two either side of that date to see much of a change. The low sun, when you can see it, casts long, beautiful shadows. Bounce light from the snow helps reduce harsh shadows. On overcast days, morning can start out quite dark, yet by midday, the clouds can act like a county sized light box. Filtered sunlight can all but eliminate shadows. I particularly like the Winter days with patchy clouds. The clouds cast shadows in some areas, but allow the sun to create bands of light in others. On those days, chances of getting a dramatic landscape are greatly improved. During the Summer months, most Alpenglow happens at the far south end of the valley. During the Winter months, Alpenglow usually occurs between the Grand and Mt. Moran. Perfect! 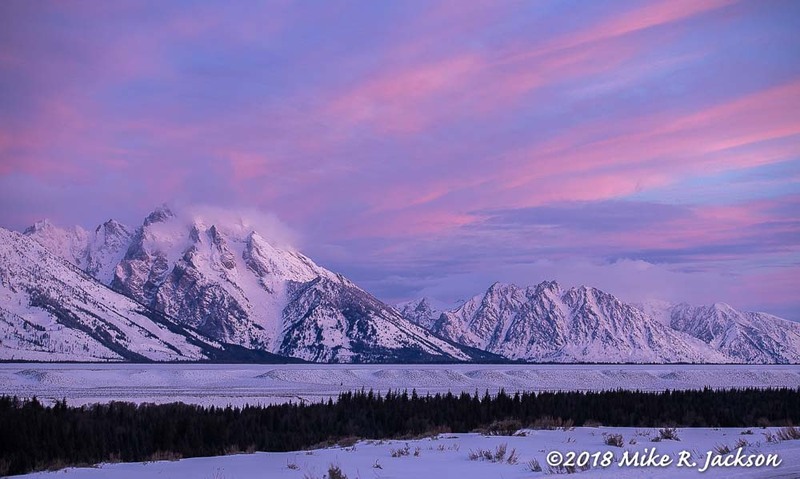 Snake River Overlook offers a good chance to capture Alpenglow, and the parking lot is usually plowed. In a nutshell, Winter photography can be challenging. 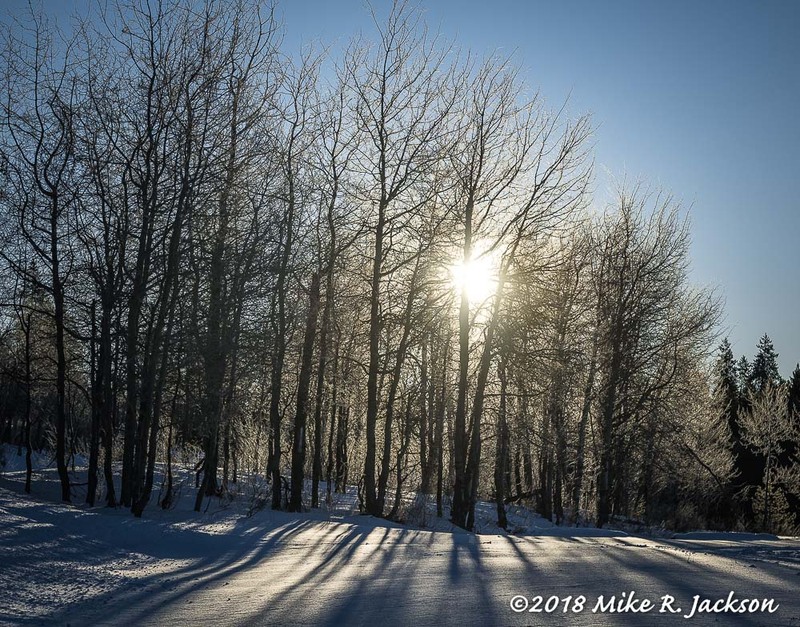 Cold temperatures can push the equipment and the photographer’s ability to withstand the conditions. Heavy coats, insulated underwear, lots of layers, and hand warmers help on many mornings. I augment the GTNP photographic opportunities buy frequenting some of the county roads around the Town of Jackson. 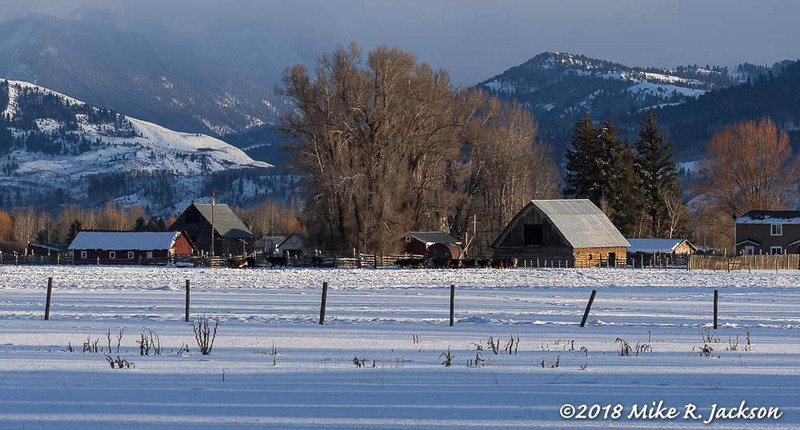 Not many of them offer vista views of the mountains, but the barns, fences, and landscapes can offer some great shooting. Both short and long telephoto lenses can be used for landscape photography. They are great for “getting to” subjects on private property or to subjects that might require shoe shoes if using a standard lens. Telephoto lenses can help isolate and compress a scene and can be used for panoramic images. Metering in many cameras can be fooled during the Winter. Specifically, auto metering will typically result in underexposed images. I’m a “histogram person”—checking the histogram on the back of my digital camera regularly. Many snow captures require 2/3 to 1 stop positive EV and sometimes more. I get a lot of chances to shoot in these conditions and can now make quick adjustments to the EV values. Relative to wildlife photography, landscape photography is more forgiving. Landscape photographers usually have more time to take a test shot and adjust as necessary. Digital noise is seldom an issue in Winter captures. Dark zones are usually limed in winter landscapes, and as I mentioned earlier, light is often reflected back into the shadows. High ISO settings are seldom needed. On many days, we get to use fast shutter speeds, reasonably high aperture settings, and relatively low ISO on hand held shots. 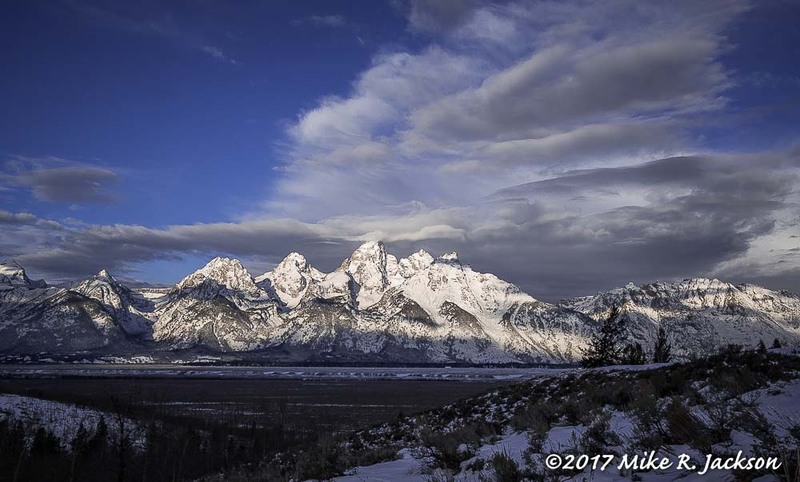 No matter what time of the year you are here, Grand Teton National Park is perfectly suited for panoramic landscape images. Current software makes stitching two to nine images a breeze. Overcast days are often dull and gray. Right? There’s seldom anything in a scene that is bright white. That’s not the case on a sunny day, but the shots taken on a gloomy day often need some additional post processing help. But, how much? My artist side, especially the watercolor artist side, loves the pure white aspect of Winter shots. This is especially true on photos taken on an overcast day. A watercolor artist starts with a white sheet of paper and then applies paint where they see subject matter. Some areas stay white. 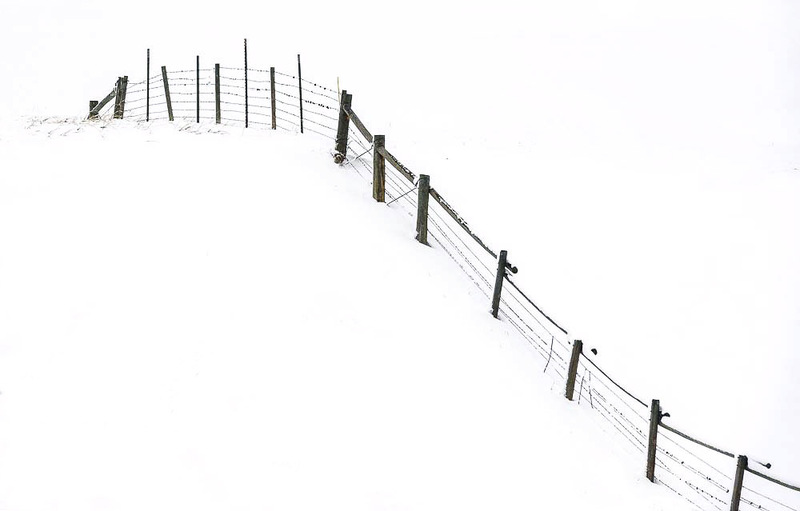 Although I change my approach and attitude on this topic off and on during the year—and over the years—I still like the simplicity available to me on Winter shots. In Lightroom or Photoshop, I can usually make a dull image pop considerably by adjusting the “white” slider and then tweaking the rest of the sliders to taste. Note: JPG shooters will have less flexibility in post processing than the RAW shooters. Modern cameras are extremely forgiving when photographing in RAW format, and the software is getting so good, I seldom use graduated ND filters anymore. 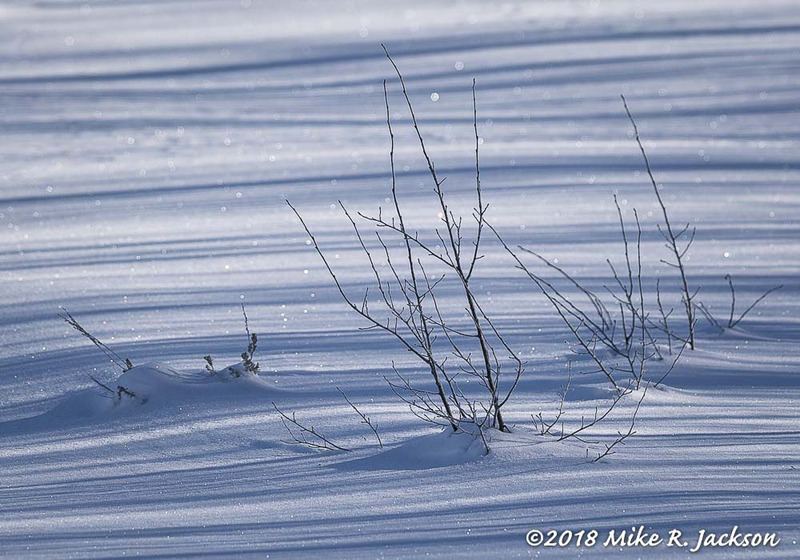 The white snow and reflected light in the bottom of a Winter landscape capture enough information to bypass the filters in most situations. 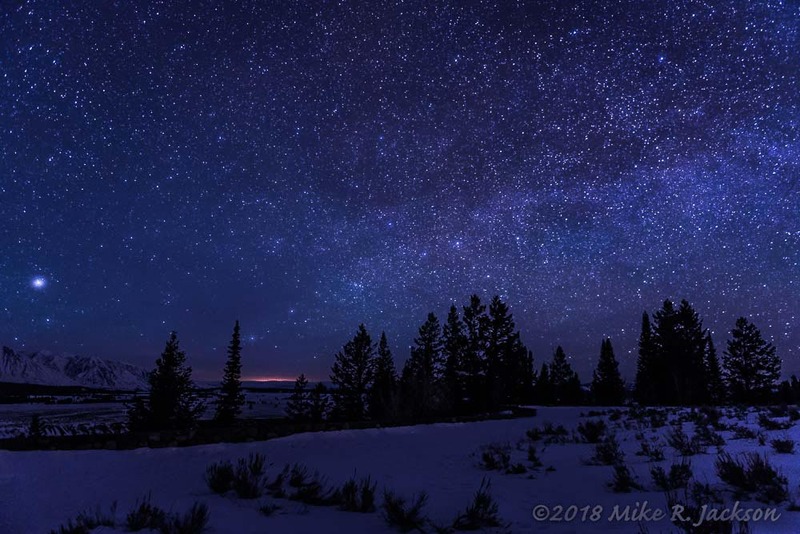 If you’ve never been to Jackson Hole and Grand Teton National Park during the Winter months, you are missing out! There are virtually no crowds and the pace of the day seems much less hectic. There are plenty of subjects if you are willing to be out in the cold weather. Get here, bundle up, and get some shots of your own! Please, if you like this page, click on any of the convenient Social Media Icons, and share this page! 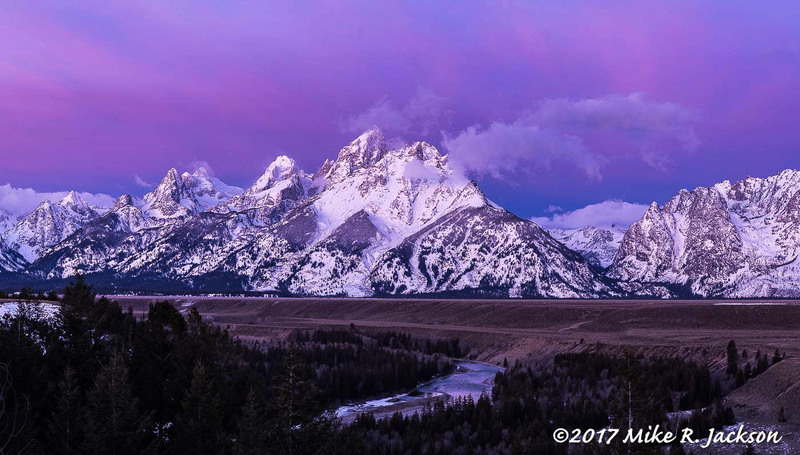 If you are interested in taking a Best of the Tetons Photo Tour with me, click the photo below! For inquiries, send an email to info@bestofthetetons.com. I have numerous openings in March, April, and May! Book early for September…slots fill fast!